« Who is the decider? For people who pride themselves on being independent, Americans too often become victims of the herd mentality. Whether it’s the approval of the war in Iraq, voting for Obama or wearing Crocs, Americans latch onto some absurd idea and follow it all the way to the disastrous end. The common problem is that important and sometimes life-and-death decisions are made based on emotions and very little knowledge and common sense. To me, the question of the light rail in Kansas City falls into the same category. No one in the right state of mind would even propose the light rail as an option which would solve any transportation problems in this city. Instead of just being dismissed as a bad idea, huge waste of money and totally worthless as a means of commute, this issue is constantly being discussed, written about, voted on, studied and even taken to courts. 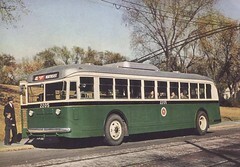 Kansas City has a rich history of public transportation which allowed the public to move around town before cars took over as the main commuter option. Cost. Some people will overpay just to be “green”. For the majority it has to make fiscal sense. Convenience. I am not driving 10 miles to the terminal just to ride the light rail for 7 miles. It has to be within walking distance or it’s too much hustle. Coverage. I am not interested in the A to B ride, unless I live in A and I am going to B. Public transportation system should blanket the area with routes that cross each other and allow passengers to jump from route to route. Constant circulation. This is crucial – I don’t want to know bus schedules, I just want to know that the bus will show up within 10-20 minutes even if I just missed the last one. One fear that I have is to be stranded somewhere with no chance to get out. Security. I want to arrive in one piece with all of my belongings. In the next few installments I will try to describe the public transportation system I grew up with. It wasn’t perfect but it worked. More than I can say about the light rail that never will.